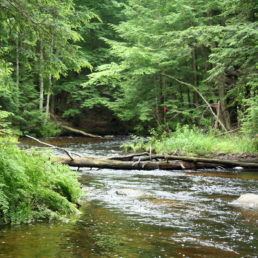 The Flowing North Preserve in New Gloucester is owned and managed by the Royal River Conservation Trust. Named for the short stretch of Royal River that flows north from the Fairgrounds until the river drops south toward the ocean in Auburn, this wooded property straddles the Royal River. Visitors can cross the river at low water levels on fallen logs, or by wading knee-deep. Much of the property is either steep slopes or floodplain. The quiet Flowing North Preserve has been enjoyed by local fishermen and hunters for generations and offers a quiet place to enjoy the upper reaches of the Royal River or to harvest fiddleheads in season. Known locally as “Hell Hole,” the vast floodplain with mature trails hosts a rich variety of flora and fauna, easily explored after descending down steep banks. Flowing North Preserve is located at the very end of Sawyer Road, off Bald Hill Road in New Gloucester. Visitors may park at the very end of Sawyer Road and walk straight ahead onto the old road toward the river banks. Road access to the end of Sawyer Road depends upon seasonal maintenance; it may not be regularly maintained in spring and winter. Even in summer, the road has very soft sand. The preserve has very limited signs or kiosks. In 2018 neighbors installed a road sign that can confuse; neighbors are working to discourage ATV traffic on the road. RRCT does have the right to invite the public to drive on Sawyer Road to RRCT’s land. However, please respect the very poor condition of the road and please give all courtesies to neighbors. Once on the land, access requires walking down a steep slope to explore old roads; there are no marked trails. This is not a good parcel for a casual stroll due to the lack of trails. But there are delightful adventures like walking up the river banks toward rips, water falls, streams, and floodplains. Or crossing the river on a log to wander aimlessly up a small meandering floodplain tributary. The river is not suitable for boats on this stretch. 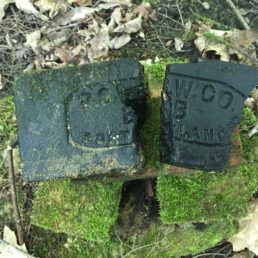 In 2018, the Maine Woodland Owners Land Trust (MWO) acquired abutting land, upriver from RRCT’s land and continuing upriver to Bald Hill Road (the Cemetery). MWO does not post its property, but parking on Bald Hill Road is not allowed. Parking at the Fairgrounds allows off-trail access down the river’s western banks, across MWO”s property through steep woods, to RRCT’s land. This Preserve is great for primitive off-trail hiking and hunting. Safe and responsible hunting on the Preserve is encouraged. As a courtesy pleases call RRCT to inform us if you plan any trapping on the parcel. Hikers should always wear blaze orange during hunting season, on all hikes. Tenting and camping is allowed, please notify us in advance of your camping plans. There are no developed tent sites on the Preserve, and no privies. If you find a developed primitive camp site, you have crossed onto private land. The best tenting on RRCT land would involve crossing the narrow river — there is no bridge. Give us a call if you plan to camp and please always abide by strict adherence to “leave no trace” principles. Please respect various postings on private abutting land. Smoking is prohibited on all RRCT Preserves. Dogs are welcome, but on leash or voice control with strict attention to pet waste removal. 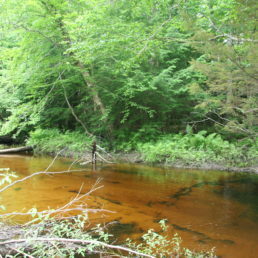 This 23 acre parcel is owned by the Royal River Conservation Trust. The Preserve is part of a now-abandoned subdivision which is reverting to large-lot rural residences or undeveloped wood lots. The adjacent parcel gifted in 2018 by Chandler Brothers to Maine Woodland Owners Land Trust creates a larger conservation vision, with better long-term recreational access opportunities to RRCT’s parcel coming from the Fairgrounds neighborhood. Additional Chandler Brothers land gifts are expected upriver in 2019 and beyond.